On January 1st, I joined a 6 week long weight loss contest with several other local moms. There was a cash prize, so I decided to really put some effort into trying to win! (Sadly, I didn't win, but I did get second place! Not too shabby.) One of my weight loss strategies was to cut out sugar. I went cold turkey- no sugar at all, except for fruit and honey. I didn't think I'd have too hard of a time with it. I knew I could stand to cut back a little bit, but I didn't think my level of sugar consumption was all that bad. I'd have a couple of gluten free cookies here, a piece of chocolate there. I did go a little crazy with sweets over the holidays, but doesn't everyone? And I did have baked oatmeal with sugar in it almost every single morning- but that was in oatmeal! Didn't count. Needless to say, I was in a bit of denial. The first couple of days were not fun. Big cravings, which I expected. But what I didn't expect was the total downer! I felt like I was seriously down in the dumps. Depressed even. I remember at one point my mind was just racing with all the reasons that I was a horrible failure at life. I was just miserable. No other reason for it, except that my body was having sugar withdrawals. I was a bit shocked that just cutting out sugar could have that much of an effect on me. Around day 4, I cut open a pear and ate a slice. It tasted AMAZING. I couldn't remember the last time that a piece of fruit had tasted that sweet! My taste buds were starting to re-adjust! It took about 5 or 6 days for the feelings of depression to subside. The cravings went away too. I have no problem now looking at cookies, cake, or ice cream and not eating any. I honestly don't have any desire for them anymore- and I had a huge sweet tooth before. You'd think that experience with withdrawal would have been enough to convince me of the dangers and addictive powers of sugar. But it wasn't. I was still off of sugar, because of the weight loss contest and because I had also started the GAPS diet, but it still hadn't sunk in to me just how serious it was until I ate some sugar again. My aunt and uncle were in town visiting, and at kindof the last minute, we had to leave the kids with them and go somewhere for a couple of hours. Normally I would have had food pre-prepared, but since it was a last minute thing, I showed my aunt where the ingredients were and explained how to make the dish- a simple chicken green curry stir fry. When we got home that night, I walked in the door and scooped myself out a bowl. I was about halfway through eating it when I remembered that since I have a food allergy, it would be a good idea to double check that she didn't add anything extra in there. When I asked, she admitted that she had added a little of the sugar that I had on hand. (Let me just interject here that this was a "natural" sugar! It wasn't even the super bad for you granulated white stuff.) Now again, I didn't think it was going to be a huge deal! I knew that sugar wasn't allowed on GAPS, but I didn't want to hurt my aunt's feelings, so I finished my bowl. I thought the sugar might set me back a little bit, but I didn't think it would matter much. I was sooo wrong. Within about 15 minutes my heart started racing. I started feeling hot. My arms started feeling tingly. I felt like I needed to throw it all back up. Not only was my body affected, but my mind was as well. I felt like I needed to just curl up into a ball and cry, and yet at the same time, I wanted to go into a rage. I'm a little embarassed to admit it, but I yelled at both my husband and the kids. I couldn't hold it together!!! I was totally flabbergasted at the affect that just a little bit of sugar had on both my body and my mind. How could I have let myself eat this stuff every day, sometimes multiple times a day??? The next morning I woke up with diharreah. Fun stuff. I continued on with GAPS as well as I could, hoping to bounce back quickly. I avoided sugar for the day, but that next evening I wanted a snack, so I made myself a couple of celery stalks with almond butter and raisins on top. I ate half a celery stick, which had maybe 10-15 raisins on it, and I started to feel the symptoms coming on again. My heart started beating faster. My left arm started tingling. I was in tune enough to notice it before it got too bad, and I didn't even finish my snack. I was so frustrated- I had been tolerating fruit and honey just fine for weeks, and just one slip up with sugar had set back my gut healing process so much that I couldn't even tolerate a handful of raisins?!? No wonder my gut is so messed up when I've been throwing tons of sugar at it for so long!!! That crazy experience only strengthened my resolve to stay on GAPS and continue to heal my gut, and to stay off sugar for the rest of my life. Nothing good can come of it! It really is addictive- some say it can be just as hard of a habit to break as cigarettes or even some drugs. That experience also lit a fire under me to get my kids off of sugar- I know that Hayden's addicted too, and that's my fault! I know it will be a crazy couple of days when I first pull her off of it, but the rewards for her long term health will be totally worth it. And by the way, after another day or so of gut healing, I'm now able to tolerate fruit and honey again just fine- thank goodness! 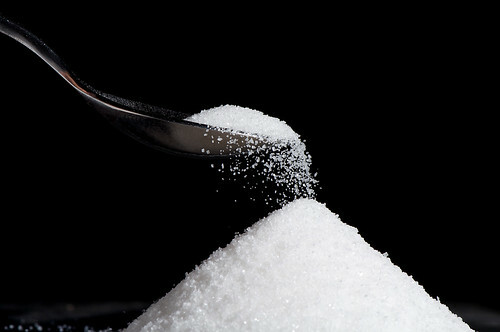 Have you ever cut out sugar? Ever thought about doing it? What's holding you back? Diva cup vs. Moldy tampon? I did what with a garlic clove? When is this going to stop?? ?